The Breakers is oceanfront living at its best! 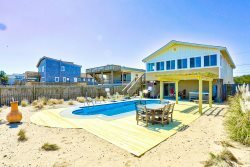 Enjoy unsurpassed panoramic ocean views from the spacious living areas and oceanfront decks from this outstanding Southern Shores retreat where the beaches steal the scene. The single-level floor plan features 5 bedrooms, 3.5 bathrooms, and plenty of seating on the oceanfront decks for sunbathing or enjoying a morning cup of coffee as the waves lap against the shoreline. A Pristine Region that’s Renowned for its Beaches. Southern Shores is one of the Outer Banks' most prestigious towns, with wildlife areas, nature trails and beaches that are among the widest and cleanest on the banks. There are no public beaches and access is limited to residents and guests only. All of the Southern Shores amenities are available to guests at The Breakers, which includes a park with playground equipment and tennis, as well as access to sound side marinas and beach. The Breakers is in close proximity to local shops, great restaurants, and area attractions. The bustling town of Kitty Hawk is a short drive to the south and the quaint town of Duck is within biking distance to the north. The home is located on a quiet street with access to a paved multi-use path perfect for hiking, dog walking, bike riding or jogging. A large dining table and additional seating at the kitchen bar will provide enough space for your family to enjoy dinner at home in the evenings, and if it is hot dogs and hamburgers you want, "The Breakers" has charcoal grills you can fire up! Stocked with a wide array of books and games, this home is perfect for quiet reading time or family game night. A few steps lead to great fall surf fishing or curl up on the comfy sofa with a good book and watch the waves from the great ocean view. Top-Level: Reading Room with Day Bed and Desk, King Master Bedroom (Oceanfront), Living Room with TV/DVD/Stereo, Dining Area, Kitchen, Bedroom with 2 Twins, Full Hall Bathroom, Bedroom with 2 Twins, Washer/Dryer, Queen Bedroom, King Master Bedroom with TV.